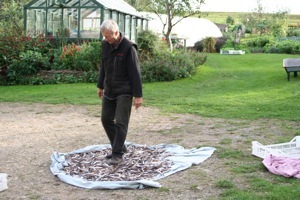 Yesterday after the first picking of dry bean pods had been drying some more in flat crates in the greenhouse, for a fortnight, by which time the pods were crackling dry, I laid them on a sheet in the yard and walked over them to break open pods and release their beans. First I walked on the bean pods, then picked out the empty pods. Then winnowed the beans in a breeze to clean them. Growth has been remarkably abundant for this time of year and some Green in the Snow mustard, planted by course students on 16th September, has grown too large for its intended use in salad! It could still be stir fried, or if unpicked it becomes a kind of green manure, picked for compost, and plants may survive the winter to provide some welcome greens. 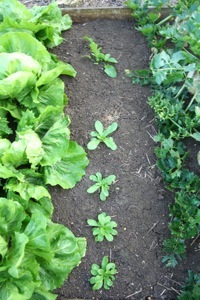 The right hand picture above shows the remains of summer lettuce which has been picked weekly for three months. Between plants on the right hand bed I sowed lambs lettuce on August 30th, and in September we planted winter salads among lettuce in the middle bed, from which we have already picked some spinach, and I plan to cover some of this middle bed with a cloche. 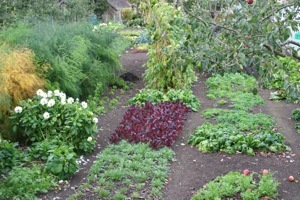 The left had bed has been planted with garlic and I am manuring it as lettuce finishes. I may need to fleece the uncloched salad against rabbits which are showing plenty of interest in the young leaves of lambs lettuce. There are many harvests still to come and yesterday it was the turn of orange squash, well ripe, compared to some Butternut which still have green leaves and need a little more time, unless frost stops all new growth, in which case I shall harvest the fruit and bring them into warmth for a final curing. 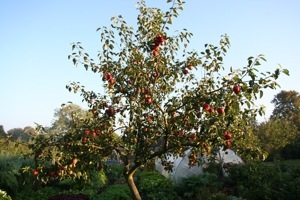 Most apples have now been picked but I am leaving a few of the later maturing varieties, for another week or so. Otherwise I have found that the picked fruit is going soft in the warmth we have had, whereas they keep crisp on the tree. 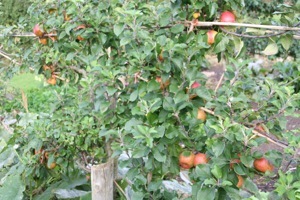 It is a trade off however, as some of the apples fall or are blown off and then bruise, so they won’t keep, but the espaliers resist wind at least. There are many super apple flavours at present, such as Jupiter, Kidds Orange, Ribston Pippin and Egremont Russet, to name just a few. Conference pears are also at their best and sadly won’t keep for much longer, unless in a fridge. As autumn sets in, after a glorious end to September, thoughts turn to the year’s final sowings and plantings and its first harvests for winter. 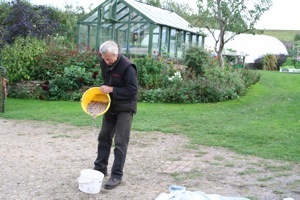 Also to preparing soil for next year’s growing. Early in October is best time for planting garlic, after clearing preceding vegetables such as courgettes or beans or whatever. Dib holes an inch or two deep and pop cloves in with their pointy end upwards, four to six inches apart. I find that rows across a bed work well, for easy weeding between, with fifteen to eighteen inches between rows (similar spacing to broad beans, see below). 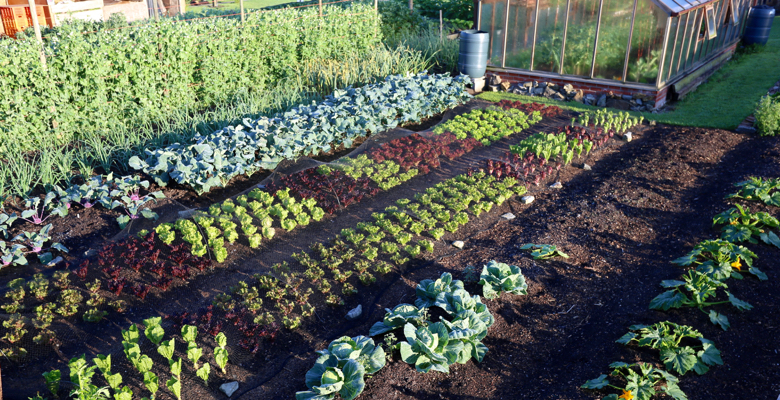 Then after planting, cover the whole bed with half or well rotted compost, to protect and feed soil over winter, when it will be broken down by frost and weather to give a soft and crumbly surface next year. I have spread cow manure on garlic in the last two Octobers and have grown huge bulbs, as well as some gorgeous second crops of kale, beans and salads, all without any extra compost or feed of any kind. Towards month’s end is time to sow broad beans. 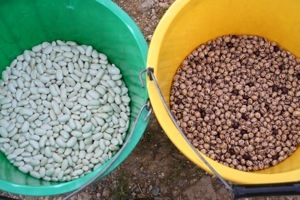 Sowing beans is similar to garlic, into two inch holes and at the same spacing. Mostly I sow Aquadulce Claudia, and some Witkiem Manita, also a few Masterpiece Green Longpod which is not reckoned to be so winter hardy but has actually been surviving recent winters quite well. The Aquadulce is white podded and reliably prolific with large pods. After sowing, I spread an inch of reasonable quality compost or animal manure on the surface and beans push through this after germinating. Surface compost nourishes both the beans and the following vegetable This spring we picked bountiful broad beans from sowings made at this time and until early November, despite the freezing weather of December. Three quarters of plants survived winter and each one ‘tillered out’ to make more stems in the spring: hence a bed with large gaps in March can look surprisingly full by May. This year’s early spring gave tender beans by the middle of May, although harvests are normally in June, when I leave some pods to become fat and mature, with a fine, rich flavour. Then after the final pick and clearing all stems, I planted swedes on June 13th which had been sown three weeks earlier in modules in the greenhouse. 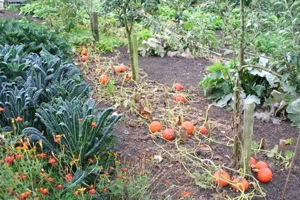 The photo shows how they have enjoyed the summer and this bed has therefore also given two excellent harvests in not much more than a year, all from the one dressing of manure in November last year. Broad beans dislike soil lying too wet and I have found that a long term policy of no dig, with some compost or composted manure on top, improves structure through encouragement of worms, whose traveling through soil creates drainage channels which are more enduring than attempts to aerate soil with spade or fork. 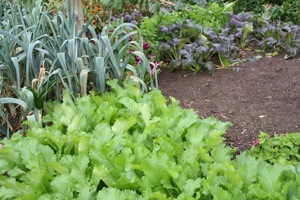 Also the thin surface mulch of organic matter helps to conserve a little warmth in the soil. 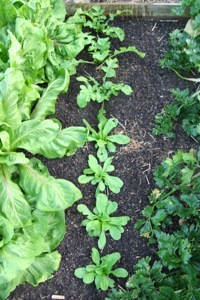 Salads for winter have passed the time of sowing, unless you are prepared to nurture small seedlings through winter for harvests in March and April. 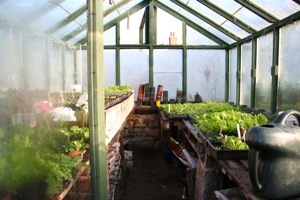 We are planting salads that were sown mostly in the middle of September: lettuce, endive, spinach, mustards, pak choi, salad rocket (wild is already planted), winter purslane, chervil and coriander. They often go into soil on the same day as cucumbers, tomatoes and basil are removed, and after soil is trodden down and well watered. Now is time to protect brassicas against pigeon damage. If you use mesh, a wide sheet can be simply draped over plants and held by stones along its sides, or if you use netting (which looks nicer because the plants are still visible) you need a support structure. 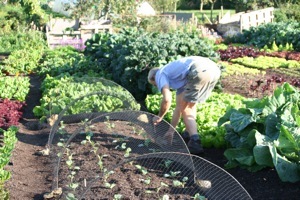 For small plants of spring cabbage I use cloche hoops and sit the mesh on them, supporting a net over the whole bed. 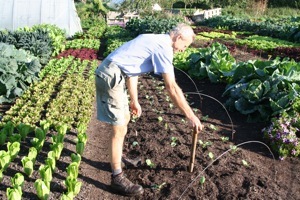 For tall plants such as kale and brussels sprouts, I knock six foot wooden stakes into the soil along beds’ sides and then require wide mesh of up to six metres to cover sides and top, again weighted with stones or stakes along its sides. As the weather cools down, parsnips come into their own with flavour sweetening and giving us some warmth when roasted or stewed. 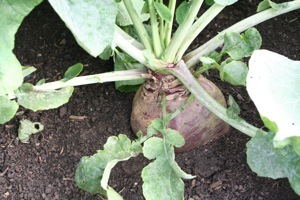 They can stay in the ground all winter, along with swedes and, in milder areas, celeriac and beetroot. But carrots are better harvested by late October (then stored in paper sacks with a little soil on) because of slugs eating roots through winter, unless you are on light soil. My winter carrots have been meshed all summer and the root fly has (mostly) not found a way in, compared to some unprotected carrots nearby which are full of rotten tunnels. When harvests finish, I suggest you clear soil of all debris and weeds above all, then simply spread an inch or two of half or well decomposed compost or manure. 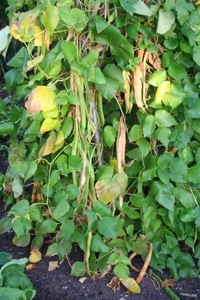 It can be a little less rotted when spread at this time of year because exposing it to air and winter frosts help the final stage of decomposition and lumps should break up through winter, with occasional assistance from you raking, to provide a soft and reasonably (not completely) fine surface for sowing and planting next spring. 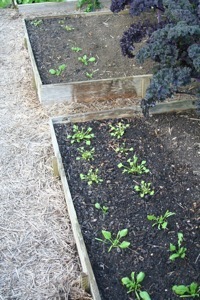 Lastly, have a look at these photos of newly planted salads in my dig/no dig experimental beds. 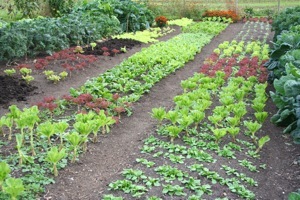 All plants were from the same sowing, planted on the same day, but there has been much more slug damage on the rocket, purslane and spinach plants growing in the dug beds, compared to the undug beds. I think this is because slugs prefer the smooth clay surface, as opposed to the more knobbly and crumbly surface of last year’s compost and manure on the undug beds. 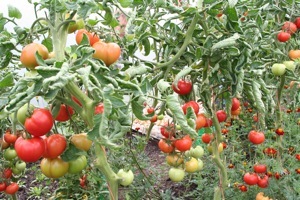 Moreover the young plants growing in undug soil look noticeably healthier. Most interesting!